Standing in a shop looking at the plethora of Halloween masks for sale I recalled a time when such a choice was unheard of. Still, we didn’t do Halloween in 1965. Bonfire night was the big thing. There were at least two different Guy Fawkes masks given away in British Fleetway/IPC comics in the 1960s. The first one I was aware of came free in a the 30th October 1965 issue of “Buster” comic. Here is the only image I can find of that 1965 mask. I’m still convinced that I have saved my own mask somewhere within Magic Robot Towers and it will no doubt surface one day as I continue my box reduction programme. 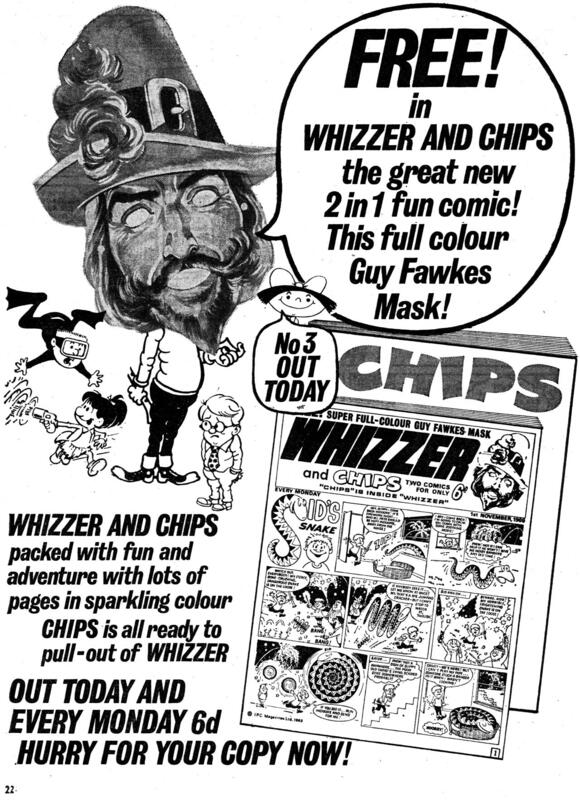 The next Guy Fawkes mask I owned was free inside the third issue of “Whizzer and Chips” comic in November 1969. It wasn’t a copy of the 1965 face but was completely re-drawn, and whilst it was still similar the hat now sported a large buckle. 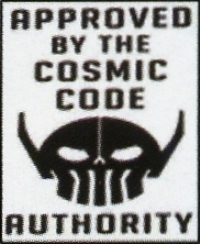 And as any fule kno it was the “V for Vendetta” Strip/Film that was the inspiration for the “Occupy” masks. PPS: And I’ve just remembered this. Available in a variety of colours and made in that odd composite material that they used to make egg boxes with. When I was a child in the 1960s no respectable Guy Fawkes effigy was burnt at the top of the bonfire without wearing one of these purchased from the local newsagents along with your Standard fireworks. Penny for the Guy? PPPS: And there was this mask on the back cover of “Krazy” comic, but you would have needed to cut it out and stick it to some cardboard to make it work….